When planets first begin to form, the aftermath of the process leaves a ring of rocky and icy material that’s rotating and colliding around the young central star like a celestial roller derby. Analogs to our own Solar System’s Kuiper Belt, these disks of debris left over from planet formation can be detected by astronomers and studied to help understand the processes that create planetary systems. Determining how the gravity of existing planets influences a disk’s architecture is one important area of study. Most of this research focuses on how planets that exist inside the debris disk define its shape, which is one of the few disk characteristics that can be directly observed from Earth. New work led by Carnegie’s Erika Nesvold looks at how a disk is affected by a planet that exists beyond its outermost edge, and demonstrates that the disk’s shape can indicate whether the planet formed beyond the disk, or initially existed inside of the disk and moved outward over time. The work is published by The Astrophysical Journal Letters. The star HD 106906 is perfect for studying this phenomenon. It has one giant planet, about 11 times the mass of Jupiter, orbiting very far away from its host star, at least 650 times the distance between the Earth and our own Sun. This planet, HD 107906b, orbits outside of its star’s debris disk, which is about ten times closer to the star than it is. 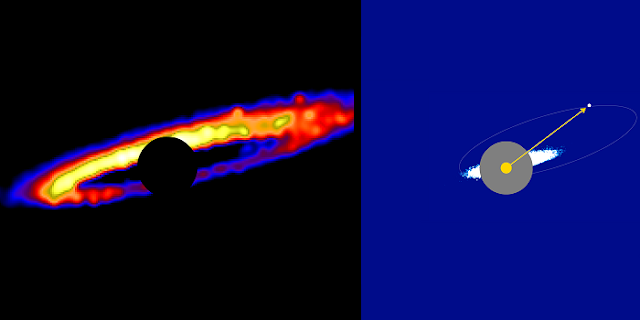 Nesvold and her colleagues, Smadar Naoz and Michael Fitzgerald of UCLA, modeled the HD 106906 system to better understand how an outside planet affects the structure of a debris disk. “We were able to create the known shape of HD 106906’s debris disk without adding another planet into the system, as some had suggested was necessary to achieve the observed architecture,” Nesvold said. The single, distant giant planet’s gravity was able to affect the debris in just the right way to produce the system’s flat, non-circular ring and to account for the disk’s observed shape and features. What’s more, Nesvold’s model was able to help her and the team better understand the orbit and likely formation history of the planet HD 106906b. The team’s results indicate that, counter to some predictions, it’s likely that the planet formed outside of the disk. If the planet had formed inside the disk and moved outward, the disk would have taken on a different shape than the one that astronomers can see in the system.